a colossal copper image of Amida-butsu (Amitabha Buddha), is the principle image of Kotoku-in. 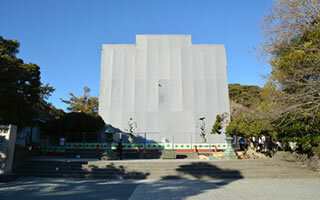 The fact that it sits in the open air makes it unusual amongst large Buddha statues in Japan. Notice on temporary closure of the temple shop and alternative temporary services during its refurbishment. ●From Kamakura: Get off at JR Yokosuka Line Kamakura Station. Change to the Enoshima Electric Railway (bound for Fujisawa) and get off at Hase Station, the third stop (approx. seven minutes from Kamakura). Kotoku-in is a seven-minute walk from the station. ●From Fujisawa: Get off at JR Tokaido Line or Odakyu Line Fujisawa Station. Change to the Enoshima Electric Railway (bound for Kamakura) and get off at Hase Station, the 11th stop (approx. 40 minutes from Fujisawa). Kotoku-in is a seven-minute walk from the station. 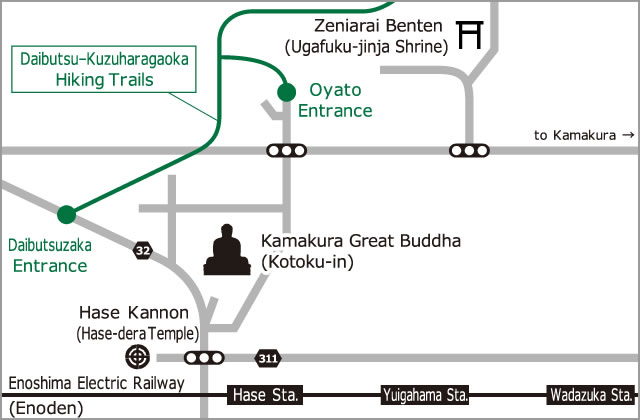 From the East Exit of Kamakura Station, take the Enoshima-dentetsu Bus (bus stop #1) or the Keikyu Bus (bus stop #6) and get off at the Daibutsu-mae stop (approx. 10 minutes from Kamakura Station). From Tokyo and Yokohama, exit National Road 1 and turn left at the Fujisawa Bypass Exit intersection. Go downhill along Prefectural Road 30 and turn left at the Fujisawa-bashi intersection. Pass under the JR Tokaido Line elevated tracks, turn left at the Minami-Fujisawa intersection and continue straight along Prefectural Road 32 toward Kamakura. Go south on the Metropolitan Inter-City Expressway (Sakaikoga-Chigasaki section). Then, get on the Shin-Shonan Bypass at the Chigasaki JCT and head toward Fujisawa and Yokohama. This will turn into the Fujisawa Bypass and Route 1. Only a handicapped parking area is available at the temple. We would like to ask other visitors to use paid public parking areas near the temple. Notice: Discounts on group admission rates no longer are available from April 1, 2017. No charge for children under six. Please click here to see which visitors qualify for free admission to the temple and the interior of the Great Buddha. Please refrain from eating and drinking in front of the Great Buddha and near the pedestal. In addition, please refrain from eating while walking as this can inconvenience other temple visitors. Please take any trash with you when you leave. Wheelchair users should, as far as possible, be accompanied by a helper, as some areas on the temple grounds are difficult for wheelchair users on their own. There is one wheelchair-accessible restroom facility (unisex) on the grounds. Visitors with pets may enter the grounds only if their pet is in a pet cage or carrier. Except for service dogs, no dogs on leashes may be walked on the grounds. SMOKING is not permitted anywhere on the temple grounds. When taking photos on the grounds for commercial use, please obtain the templeʼ s permission beforehand. Download the application form from the website, fill out and sign the form, and submit it to the temple office. Visitors are free to take photos for personal use as they wish. But we ask all visitors to refrain from flying drones in the precincts and using selfie sticks in the interior of the statue. There are no professional photographers on duty at the temple. The templeʼ s cycle parking lot is for bicycles and mopeds only. The temple assumes no responsibility for theft, minor accidents or other incidents in this parking lot.